Hong Kong experienced over 79 days of mass protests and civil disobedience in 2014. Such events which were initiated as the Occupy Central movement quickly evolved into what is now known as the Umbrella Movement or Revolution. What happened on the streets of Hong Kong after 9/28 (28th September 2014) was a new precedent never witnessed on such a large-scale. Firstly, I’d like to argue that the Umbrella Movement is not just confined to the 79 days of mass public protest in the streets of Hong Kong. The principles and values conveyed throughout the Umbrella Movement have been present in Hong Kong before and continues to be in 2015 and beyond. The only question is really how active or dormant will the average Hong Konger be to these challenges facing the city’s governance and future. Some of the key turning points and incidents within the 79 day protest are the student strike, 9/28, Solidarity rallies overseas, the Dark Corner incident, the unfolding of ‘We want genuine universal suffrage’ on Lion Rock Mountain, the meeting between the students and a government delegation led by Carrie Lam, the formation of Umbrella Art around Lennon Wall, ‘shopping trips’ in Mongkok and the eventual Police clearance in December 2014. The election of many young pan-democrats under the ‘Umbrella Soldiers’ political banner in the 2016 District Council elections is also reflective of the sociopolitical shifts in Hong Kong since 2014. 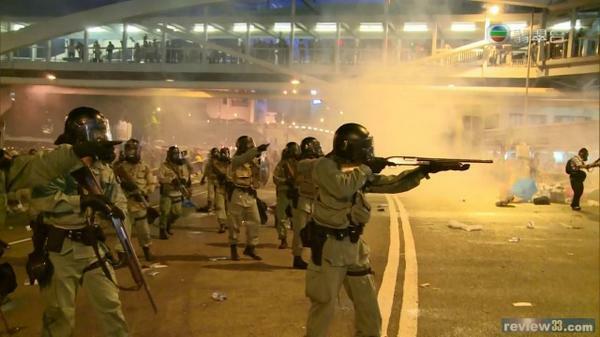 Heavily armed Police in Hong Kong fire tear gas and threaten the crowds with rifles in the first attempted clearance on the night of 28th September 2014 in Admiralty. What were some momentum drivers and observable trends in the Umbrella Movement? The first attempted Police clearance in Admiralty on the night of 28th September 2014 which involved tear gas and initially thought to have included live ammunition set the scene for an even larger ‘people’s protest’ in the following days. What was viewed internationally as heavy handed Police tactics sparked condemnation from foreign governments and protests in support of the Hong Kong students and Umbrella Movement in many capital cities around the world. The failure of the Hong Kong Police to retake the streets on 9/28 showed gave hope to the Umbrella Movement that large congregations of the people can stand up against the government authorities as well as further added to the narrative of a tyrannical dictatorship targeting its own citizens. One noticeable trend that stood out to me was the fact that many of the protesters only camped out in the streets in the evenings/overnight and returned to their day jobs or work during the day. Despite calls for a general strike and university class boycotts, many of the protesters either still believed that their ‘day job’ was more important that their socio-political struggle or they were hindered by their ‘day job’ from being more active in the Umbrella Movement. I believe it is fair to say that after the 1-month mark of the 79 days of the Umbrella Movement, protester numbers much dwindled with attempts by the unofficial protest leaders to rally support largely falling on death ears. Feelings of antagonism in Hong Kong towards the Umbrella Movement could also be felt as the protests carried on especially towards the latter half the occupation with the lack of new developments or achievements. A Journalist’s Reflection on the Umbrella Movement (Part 3) will be published next week.